The B 880 PLUS is BERNINA’s top-of-the-line model and leaves nothing to desire: Discover great NEW features to achieve the most beautiful results in sewing, quilting and embroidery. The B 880 PLUS is enriched with exciting embroidery features like Pinpoint Placement, Enhanced Editing Functions, Total Embroidery Stitch Control and much more. Imagine a machine that automatically responds to your needs. The presser foot automatically lowers at the start of a seam and lifts again at the end. The B 880 PLUS will even cut the thread for you at the end of a seam or color change in embroidery. The feed dog raises and lowers automatically for free-motion stitching and embroidery. And of course, fully automatic threading is yours at the touch of a button. When you create on the BERNINA 880 PLUS, your ideas come to life. That’s because it offers the most sewing and embroidery space unbeatable speeds, and the most advanced ergonomics of any home sewing machine. It’s time to think bigger. The B 880 PLUS includes a meticulously engineered extended free arm area with a full 12 inches of space to the right of the needle and five inches in height. With this extra large area, you’ll have the added benefit of a jumbo embroidery field, an extended space to expand your creativity. 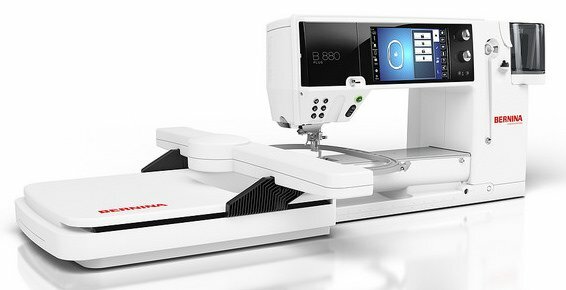 The BERNINA 880PLUS includes a library of over 1,764 stitches, conveniently stored by category for a wide variety of applications. You’ll find the perfect stitch for every sewing project. Over 400 high-quality embroidery designs, including motifs by well-known designers, and 12 font styles are perfect for personalizing your projects. The seven-inch touchscreen on the BERNINA 880 PLUS offers high-resolution images and brilliant colors. Cutting-edge touchscreen technology lets you choose from a wealth of innovative functions. The BERNINA 880 PLUS offers drag and drop, vertical scrolling and the swipe function for deleting motifs easily. It also features a highly intuitive onscreen operating concept providing numerous personalized settings. The BERNINA 880 PLUS offers hundreds of stitches that are clearly categorized and easily retrieved. With the innovative Stitch Designer you can edit these or create your own stitches. Simply draw your ideas directly on the screen. The BERNINA 880 PLUS converts the design with a click into a stitch pattern. You can also change and save existing stitches. The possibilities are endless and your stitch library is continually expanding. Mirror image, rotate, combine and resize designs right on the color touch screen. Built-in basting boxes hold difficult to hoop items in place for embroidery. Create arched lettering effects, adjust design density and even bring decorative stitches into embroidery. Automatically color sort complex combinations, preview alternate color options on screen with the help of the Color Wheel, and save to your machine or a USB stick. Wish to stitch out border designs? The Endless Embroidery function will walk you right through the process. Finally, you’ll love Absolute Check for perfect design placement. 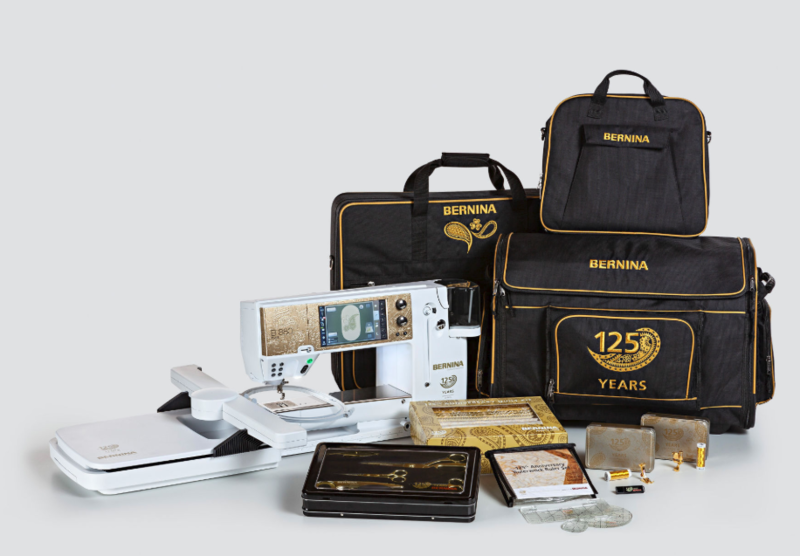 The BERNINA 880 PLUS includes 150 built-in embroidery motifs from well-known designers.